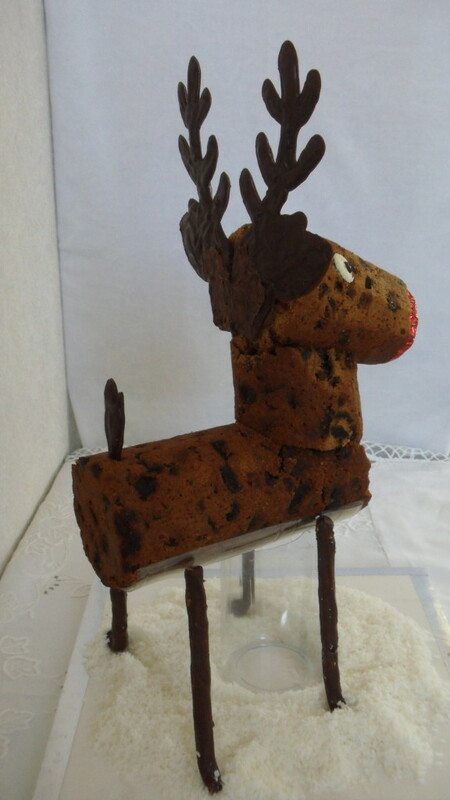 Rudolph is an original cake design planned and constructed by Mum and I. He stands 44cm tall and his body is made from a rich fruit Christmas cake, with chocolate antlers/ears, chocolate tail, and chocolate covered candy canes for the legs, chocolate eyes, and a marshmallow covered in red tin foil for the nose. The only thing that isn’t edible is the tin foil. To make Rudolph, all you need is a few solid days of cake construction time, some crazy ideas, a flexible workplan, and a “that might work” attitude! Stage 2: Construct Rudolph’s body, neck, and head. Stage 3: Make the chocolate antlers/ears, tail, eyes, and legs. Make the nose. Stage 4: Attach all the pieces to the main body shape of Rudolph. Stage 5: Stand him up, hope for the best, and make sure you get a photo! Rudolph’s basic shape is based on a sketch Mum drew in the 1980s, with the idea of making a reindeer out of wood. She never got around to this wooden version, but kept the sketch and eventually stuck the piece of paper into the back of one of her recipe scrapbooks. 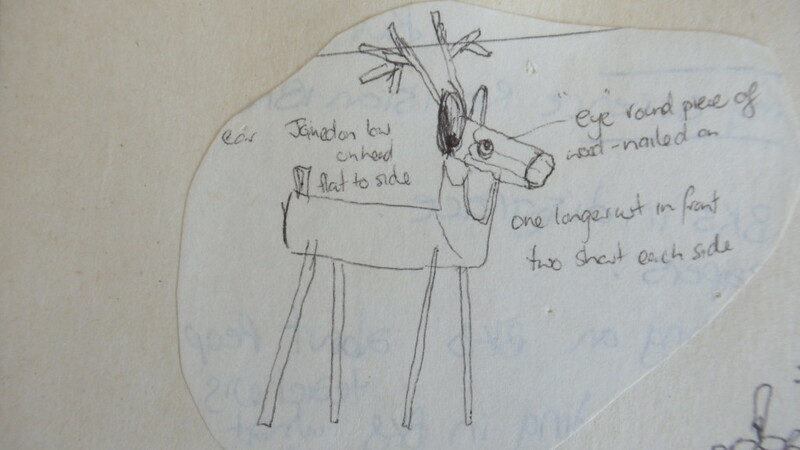 The following photo is of the drawing that sparked this whole project off – this is Mum’s original sketch, and the inspiration behind the Rudolph Christmas cake. Mum and I didn’t look at any other Reindeer pictures, and forged ahead with our plans, holding several in-depth planning sessions throughout the year. As Christmas neared we realized the scale of what we were about to take on. We began the project in November, baking the three cylindrical cakes, and on Christmas Eve we started constructing these cakes into Rudolph’s body. To get the cutting angles right, we cut cardboard rolls as test patterns to see which was the best way to join the cylindrical cakes together, but in the end Mum ditched all the technical ideas, and just went ahead and started cutting the cakes. We then attached his shiny red nose. The next stage was to make the chocolate antlers/ears, and tail, so I was up early on Christmas Day melting chocolate to make a start on the first layer, then melting more chocolate throughout the day to add more layers. Rudolph took shape over the next few days. We made up a lot of the construction as we went along and if something didn’t quite work out, we went back to the drawing board and thought of alternatives. Finally, after several intense days of construction and planning, it was great to see the Rudolph cake come to fruition (pun intended). When Rudolph was complete, Mum muttered something about “never again” (I’m sure she was joking?!) But, the end result was worth all the effort and we both are very proud of our original Rudolph cake, or “Venison Cake” as he became known. He was adorable to look at, standing tall and looking ever so cute, he was a cake with real character and attitude. If only he didn’t have to be eaten! 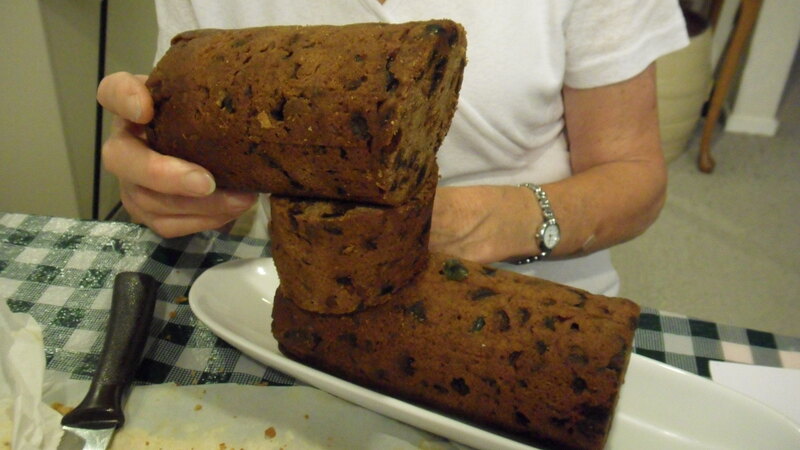 This Christmas cake starts with the fruit mixture boiled in a pot. This is a great way to start the cake as the boiled mixture can be cooled and refrigerated and kept for a week or so if you don’t have time to make the rest of the cake until later. Rich fruit cakes improve with age, and should be baked at least a month before they are going to be enjoyed, as this gives the texture and flavours time to improve. Plus, the cake needs time to have a ‘brandy bath’, where a small amount of brandy is added over the cakes for about 3 weeks and this soaks in to give that dense, moist look to the cake when it is cut, and also gives a lovely brandy flavour. 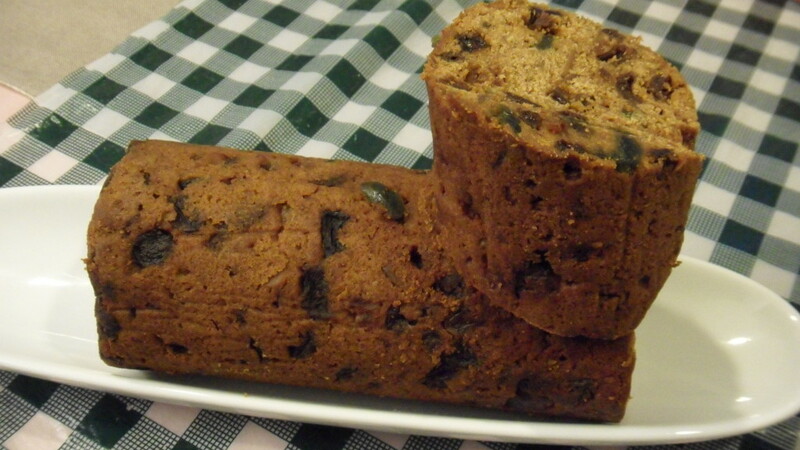 To make the Rudolph Cake you will need 3 cylindrical tins 170mm tall x 80mm diameter, with a lid at one end. Boil all together for 10 minutes, then let cool and stir in that extra capful of brandy. Mix the eggs in one at a time, mixing well after each addition. 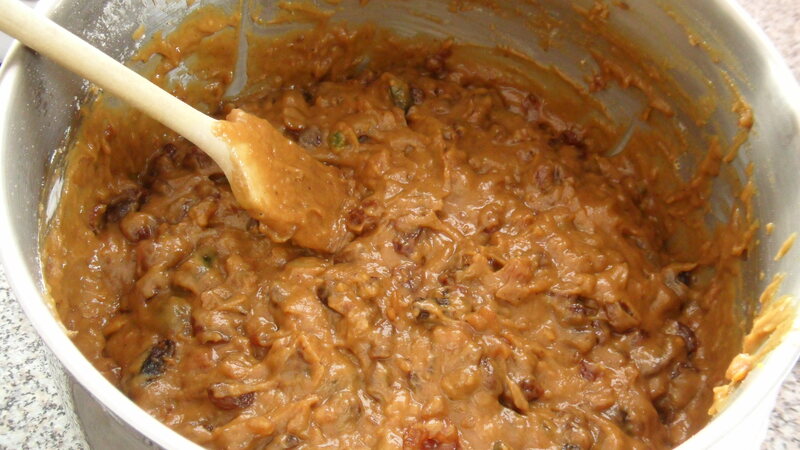 Add the dry ingredients in ¼ amounts, stirring well after each addition, but not over-mixing. Remember it is traditional to make a wish while stirring. Prepare the tins. Spray the insides of the tins and the inside of the lids with baking spray (remember you only need 1 lid per tin as they are baked standing up with the bottom lid on and the top lid off). Then line all inside surfaces, including the lids with baking paper. 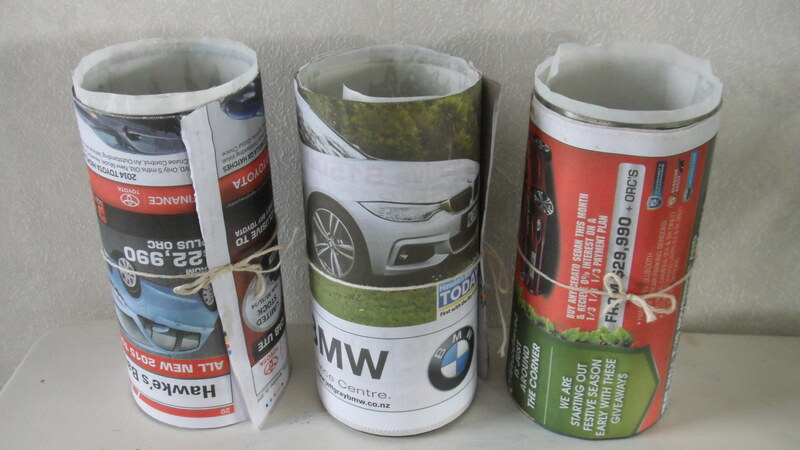 Wrap the outside of the tins with 4 layers of thick newspaper and tie securely with string. This prevents the cake from burning and gives it an even bake. 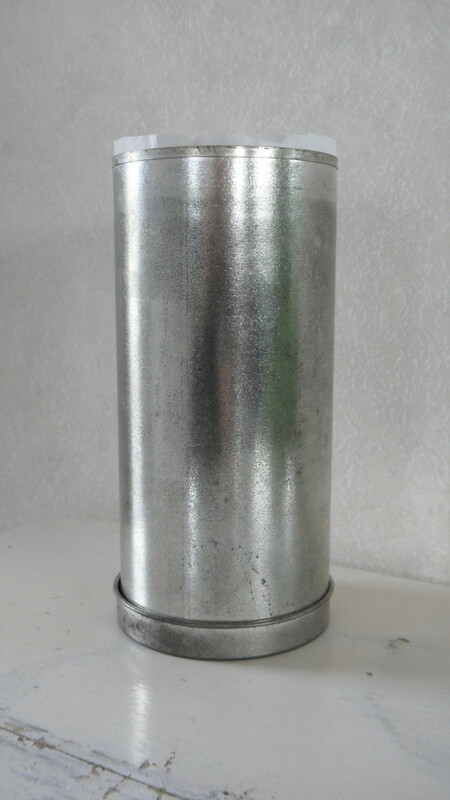 Bake with tins standing up with no lids on the top. Place the cakes on six layers of thick newspaper in the oven to prevent the cakes from burning. Bake at 150 degrees Celsius for about 1 hour and 20 minutes. Check the smallest cake before time is up, as being smaller, it will be cooked before the other two cakes. 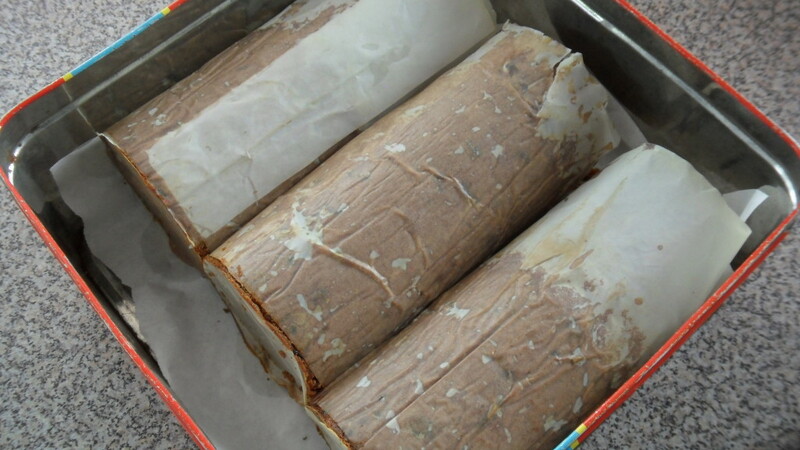 Wrap the cooled cakes in baking paper and store in a tin. ‘Feed’ the cakes with brandy over the next few weeks. Do this by removing the baking paper and spooning a small amount of brandy over the cakes until wet all around (but not drenched) – roll them over to get all sides. Let the cakes dry and place baking paper back on and seal cakes back in the tin. Do this weekly (or every 5 or so days) until you want to assemble the cakes. 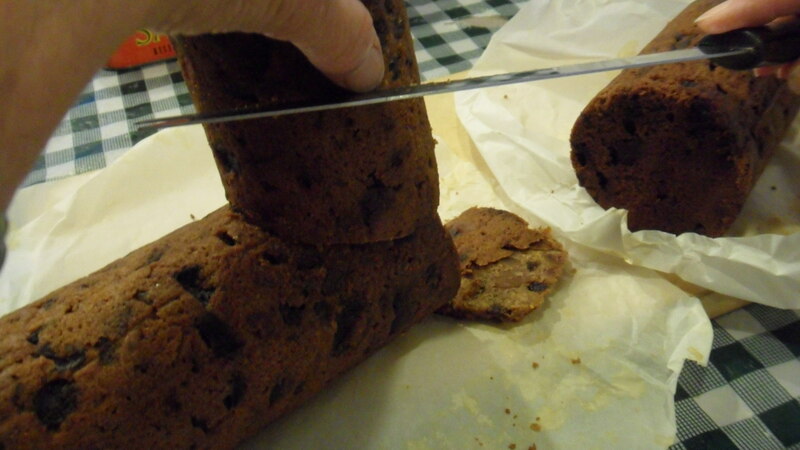 Avoid poking the cakes with a skewer to let the brandy soak in (as you do with other cakes), as this will weaken the structure of the cakes, and they need to be solid, with no holes poked in them or the cakes could break apart during construction of Rudolph’s body. C O N S T R U C T I N G R U D O L P H …..here we go….. He stands 44cm tall from the top of the antlers to the end of his feet (or hooves). The body, head, and neck together = 20cm tall. With the largest piece of cake, which will form the body of the reindeer, cut an angular slice where the base of the neck will attach. The next piece is the neck cake. This is the smallest cake and fits onto the angular cut just made to the body. The base of the neck cake needs an angular slice with a slight angle backwards (this is for balance). The top of the neck also has a slight scooping out of cake. This is so the rounded part of the head cake will sit snugly in the curve. Next, attach the head piece of cake, which is the second largest cake, and sits in the slight scoop at the top of the neck. When all pieces are aligned and in place, attach all pieces together with skewers that are long enough to go down through the top of the head, through the neck and into the body, without protruding to the underside of the body. Chamfer the top of the nose so it is flattened like a deer nose, and shave off pieces of cake on either side of the head to give a shaped face. Cut the nose length where the proportions look right to the rest of the body, and cut it flat on the end so a piece of tin foil covered marshmallow can sit flush on the cut end of the nose. Cut the sides of the neck so they are shaped to look like a neck by cutting from about halfway up the neck towards the head on an inwards angle. Then, from halfway down the neck, cut downwards on an inwards angle towards the join of the neck and body. This gives form to the neck, and you may have to shave some of the top of the head as well to give the head lines a smoothed look. Tidy up the tail end of the main body piece of cake. Cut it straight through where the proportions of the body length look right. The antlers/ears and tail are made out of three layers of Whittaker’s 50% dark cocoa chocolate. On a piece of baking paper, draw antler/ and or ear shapes, (I combined the ears and antlers together in one piece because they are easier to keep together this way) plus draw a small tail. Make the tail shape with a bit extra at the bottom, such as a small spike shape, as this will be the piece that will sit into the cake and hold it in place. Heat a pot of shallow water on the stove. Place a heatproof bowl over the water, making sure the bottom of the bowl doesn’t touch the water level in the pot. When the water is steaming, place chocolate pieces in the bowl. Gently heat. Do not stir, or get water in the chocolate. When chocolate looks melted give it a quick stir. 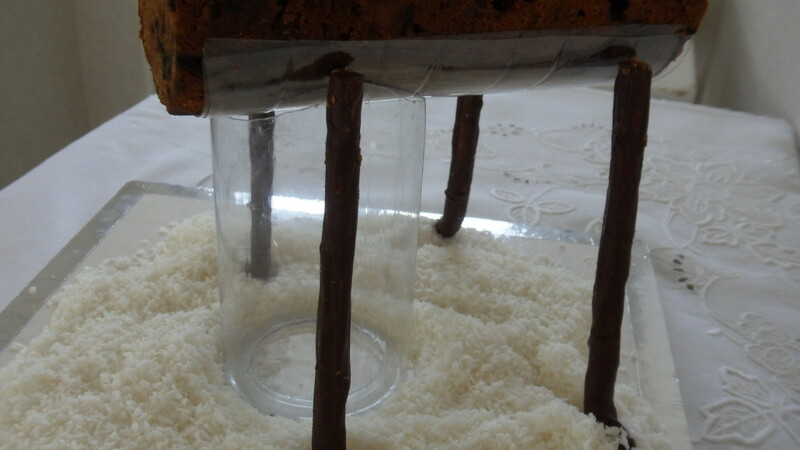 Use a skewer or chopstick or other implement to ‘paint’ the chocolate onto the baking paper within the template lines. Place in fridge to set. Repeat when set, and return to fridge again. When two layers of chocolate have been built up on the front and set, turn the shapes over and place a layer of chocolate on the back as a strengthening layer. The nose is formed from a piece of flat round marshmallow covered in a piece of red tin foil. Shape it to fit perfectly to the flat piece on the end of the nose. The legs are made of candy canes covered in dark chocolate. This is what we had available at the time (you could find something stronger). We snapped off the rounded part of the candy cane, then dipped them in chocolate and let them set in the fridge. The eyes are made of white chocolate ovals with a dark chocolate dot in the centre, forming the pupil of the eye. Draw oval templates for the eyes onto baking paper. Melt a small amount of white chocolate in the microwave. Paint the chocolate within the lines of your template to create the oval eyes. 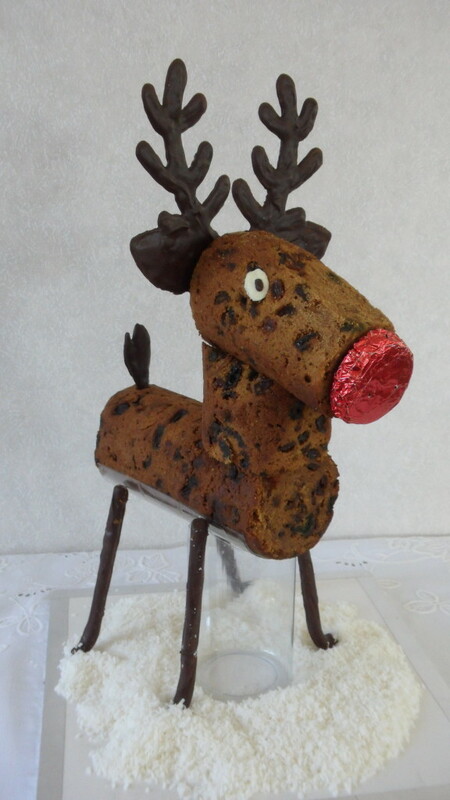 Place a small dot of dark chocolate onto the white chocolate where you think would be a good place for the pupil of the eye – remember the placement of the pupil creates ‘character’ and is very important forming the expression on the face of your reindeer. Attach the red tin foil nose to the flat nose end of the face with 2-3 toothpicks. Place the eyes in position using melted white chocolate to hold them in place on the cake. Make a small incision at the end of the cake to place the tail in, and the tail should sit in place by itself. Add the antlers/ears: If any excess chocolate needs to be cut off the shapes so the pieces fit neatly behind the head, heat a sharp knife in boiled water, then use the heated knife to gently slice through the chocolate. Melt a small amount of dark chocolate and place it on the base of the antlers on the parts that will be attached to the back of the head. Remember that the melted chocolate is placed on the bottom of the antlers on the side that will be facing out, showing the ‘good side’. 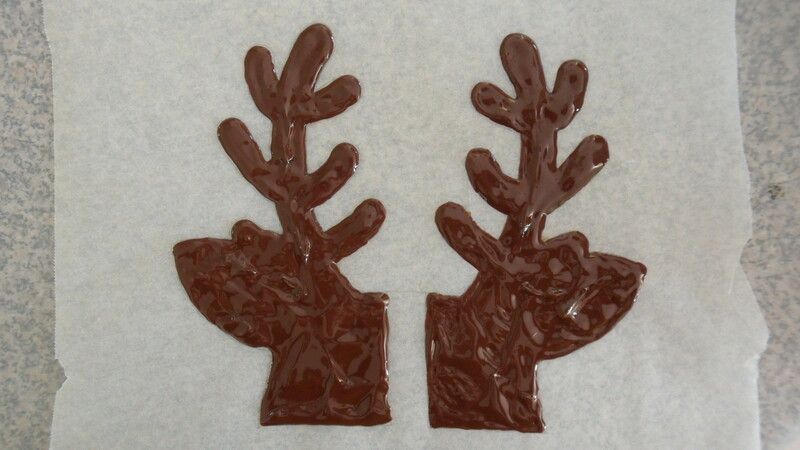 Place antlers/ears onto the back of the head and hold in place until chocolate is set. Place desiccated coconut onto a cake board so it looks like Rudolph has his feet (hooves) in snowdrifts. And that’s about it really – how simple was that? I’m joking! With the leftover shavings and cuttings of cake from Rudolph, we made Christmas Pudding Truffles, and covered them in dark chocolate, with white chocolate dripped over to resemble custard on a Christmas Pudding. 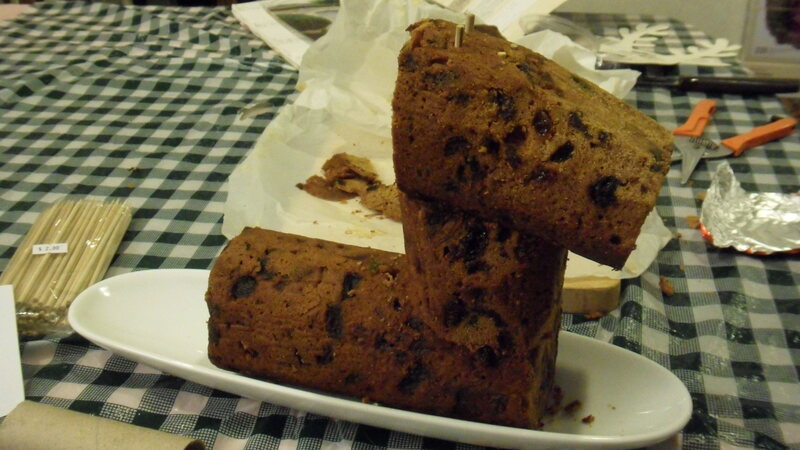 …..And we have started planning for next years Christmas cake, a Snowman!